For more than 50 years, the elevated Bonaventure Expressway cut across the city center. This major thoroughfare was the main gateway to downtown Montréal from the Champlain Bridge crossing the mighty St. Lawrence River. It accommodated more than 27,000 vehicles per day, including 1,900 buses. Rather than extending the service life of this structure, built in 1966, more than half a mile of the elevated expressway was demolished to make way for a new ground-level urban boulevard and more than eight acres of continuous public space. This large-scale redevelopment, the first one of its kind in Canada, made it possible to: create an elegant, functional and people-oriented gateway to downtown Montréal; mesh together districts that were previously isolated by the expressway; and support private mixed-use development in the area. The construction of 20-foot-wide landscaped sidewalks and more than one mile of bicycle paths helped drastically improve the active transportation options available to both pedestrians and cyclists. In addition to reinventing the way the various modes of transportation interact, the project features a striking series of public spaces. 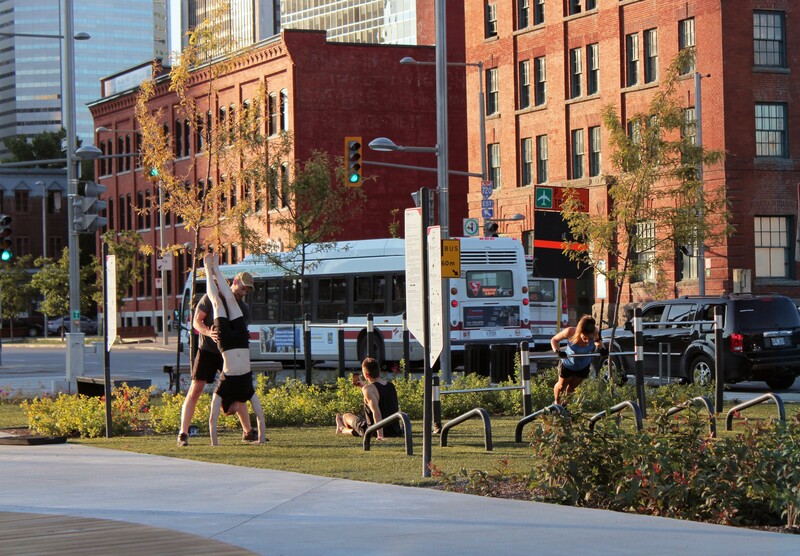 Covering an area equal to five football fields, the new public spaces are located in a redeveloped part of downtown that previously comprised industrial districts that had no parks or squares. The intense consultation process with the district’s residents and workers was a major contributor to improving the space and services. 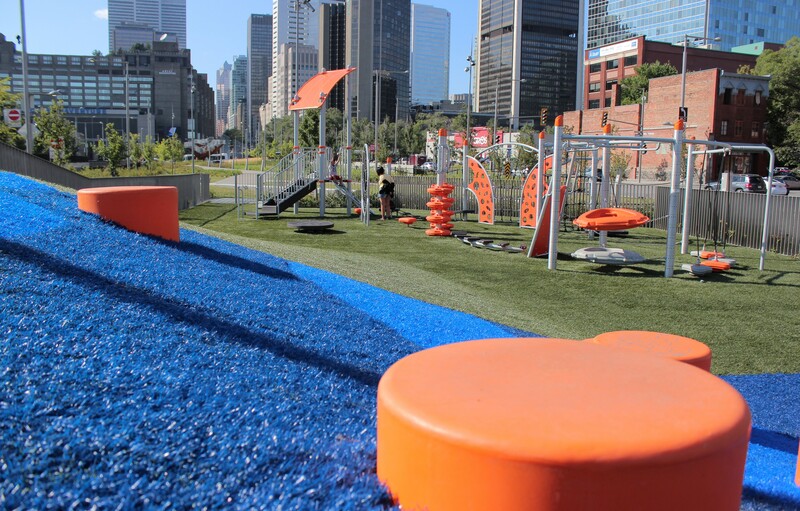 The area now includes a 1,300-foot linear bench spanning six city blocks, 12 lounge chairs, eight picnic tables, two ping-pong tables, a play area for children, an outdoor exercise area and a dog run. 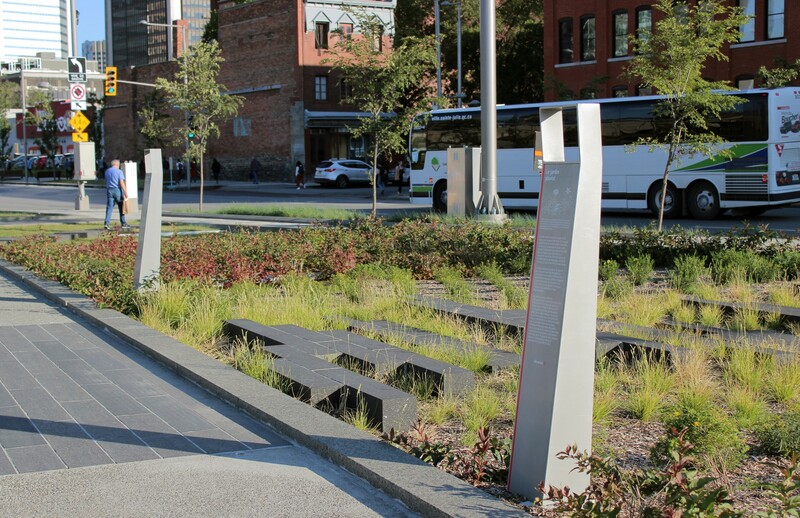 Montréal’s city center now boasts a new green promenade that provides a unique user experience and a contrasting vibe to that of neighboring streets. Public art played a pivotal role in the undertaking. The thresholds of the new boulevard stand out with two monumental sculptures that help create a distinct and symbolic space. At the northern end is Dendrites by Montreal artist Michel de Broin. 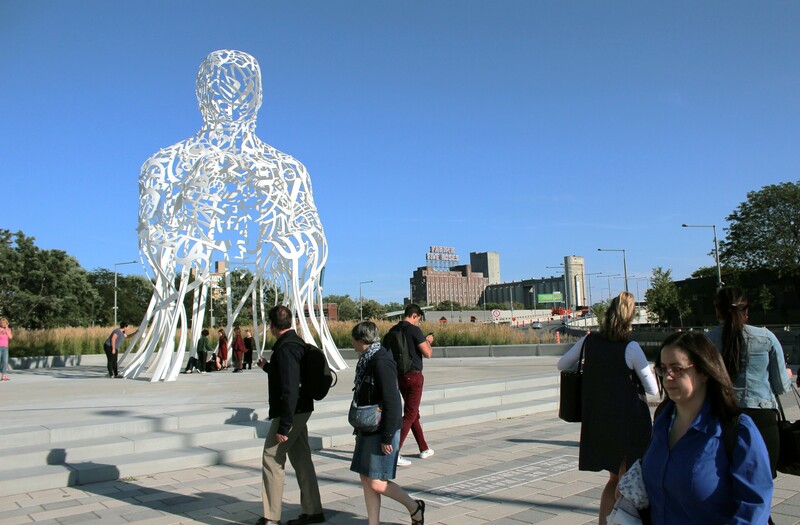 At the southern end of the boulevard, Source by Spanish by artist Jaume Plensa greets those entering and leaving downtown. The project’s strong engagement towards sustainability begins with planting more than 300 trees and an impressive 30,000 shrubs and perennials, including a 53 percent native plants score. This extensive greening of the district will bring the canopy cover to 27 percent within the next 10 years and will help sequester 4 metric tons of CO2 in the first year alone and more than 310 tons over the next 30 years. 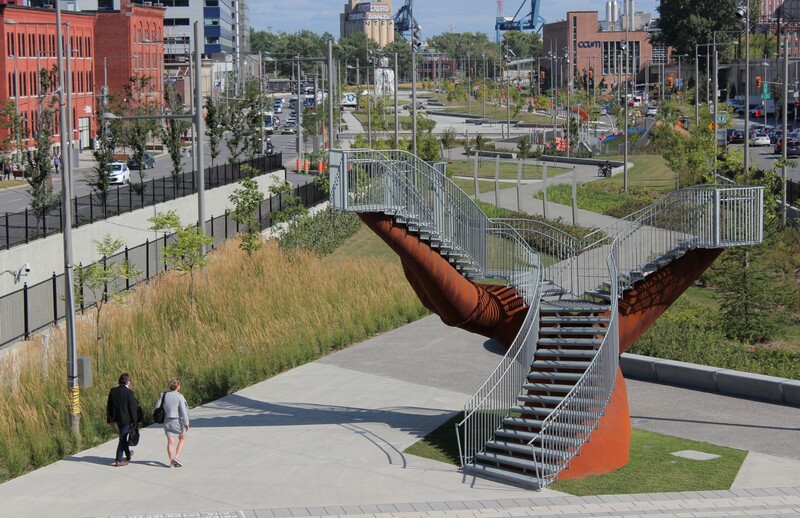 The project also manages rainfall events on site with over 80 percent of visible stormwater features as amenities that are visually and physically accessible. These grassed areas, rain gardens and planting beds have been designed to receive runoff from adjacent impervious surfaces significantly reducing the amount of water otherwise directed to the municipal sewer system.